Hope lots of folks make cool book clocks. LOVE the cplaying card box..right up my hubbys alley! I might have to whip one of these up and give it to him! 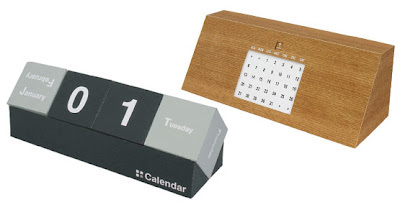 Those calendars - what a great find! Another really great idea is a vinyl record bowl. Who doesn't like records and music? It's super easy to make and it's great to hold fruit or chips for a party! Thanks for the links! I ended up making myself one of the calenders. This is an awesome post. I was just thinking the other day how welcome some good "handmade for men" ideas would be, but I could only think of a couple. Good work! Excellent Ideas! I'll have to add these to my list! Where can I find instructions for the black and white calendar pictured int he post? It was on the calendars page with the wood one and others, but it looks like it's not there anymore. Bummer! Homemade BBQ sauce and BBQ aprons are good guy gifts! !